When I was a young girl, the idea of swimming underwater for unlimited amounts of time without needing to come up for air fascinated me and kept me solely enthralled for hours. While swimming I could feel what it would be like to fly and often I would take a weight down with me to hold me on the bottom, and lay in the under water world and look up to the sky through the myriad of wavy reflective colors through the sun light, safe in my peaceful underwater heaven. I tried several experiments in attempting to devise a system that would enable me be like a mermaid and breathe underwater. I cleverly discovered that by practicing everyday using deep inhaled breaths as an exercise expanded my lungs in such a way that it gave me extended amounts of extra holding power, which improve my underwater meditations immensely. In my early teens I even competed in under water sports, the love ran deep. I lived for the dreams where breathing underwater and flying were effortless and many times found myself in a tropical lagoon where dolphins, faeries and mermaids all played together. A male narrative voice once told me in one of these dreams that this is where I use to live. To the Stars… the Sun and cosmic Moon. Adorned in shiny silvers gold…wings blessed too… behold. 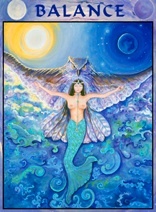 In the painting of “Mermaiden” we see she is part human female with wings of the Owl and part fish. She holds the sun and moon in the same sky, depicting her mastery of earth, fire, air and water. The precious jewels around her neck and crown are colors of the rainbow to align her chakras and balance her energy radiating out from her body. Her breasts hold the nurturing nectar of the Goddess. Her open arms invite us to open the pathways to our hearts and find balance within our masculine and feminine. The sun and the moon in the same sky indicate day and night, light and dark in balance. She possesses the pearls of the sea and the gifts of the earth. She flies to the heavens with the silent wisdom of owl and swims into the depths of the oceans of emotions keeping watch of the tides to retain a perfect balance in the natural world around her. The Mermaiden is the Goddess with everything, all in balance and in love. She reminds us to hold a neutral Balance of our emotions. As we observe our self throughout the day watching where our perception feels unbalanced we can discern what is distracting or disempowering in any way and make adjustments. Recognizing our self as a neutral witness takes will-power, but well worth the effort as it is the balancing factor to peace and happiness. Eventually we see we are in-charge of our moods, albeit depressed or elated and with conscious choice we can bring balance into our emotions. There is great power in water to show us the way to stir emotions up from the muddy bottom so clarity can bring more stability into our world. When we stop with intention and observe we can see why we have been running from our self. All answers lie within our inner knowingness. Know that this is already done on another plane manifest; the dimensional plane where Mermaids, Dolphins and Fairies play together with our inner child. The Mermaiden reflects perfect balance of the polarities, as the Feminine and Masculine within, Spirituality, sexuality, your physicality and health, and emotional well Being ness within our Soul. Sooner or later every soul will turn toward authentic power. Every situation serves this goal and the choice moment to moment to move more into balance is a conscious choice.